Each year, for the last three years, my partner and I have left sunny Sydney in search of snow for my birthday, all thanks to miles and points. This year, we decided to visit Verbier, Switzerland — primarily to experience the highly-awarded W Verbier Hotel since we could use our Starwood Preferred Guest (SPG) points, now Marriott Bonvoy points. Geneva (GVA) is the closest airport to Verbier, and when we were planning, there was one clear option — Qatar Airways. 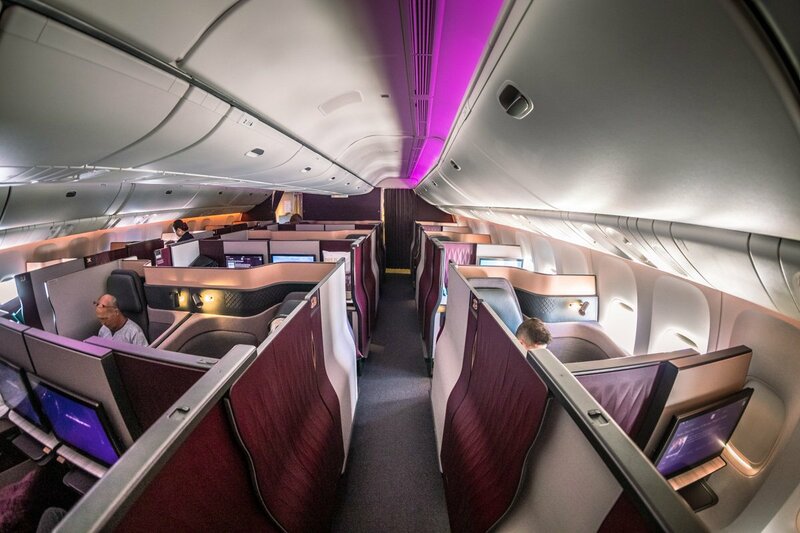 Qatar Airways flies a Boeing 777-300ER from Sydney in addition to an Airbus A380. 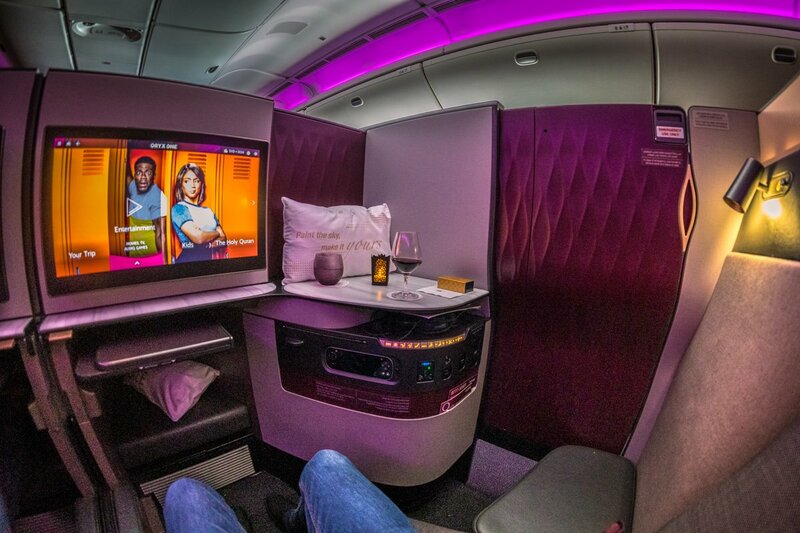 I knew it would be only a matter of time when the 777 would be refit with Qatar’s highly-regarded Qsuites and in March 2018, I took a gamble when two award seats unlocked not knowing if those award seats would have the new Qsuites in time. 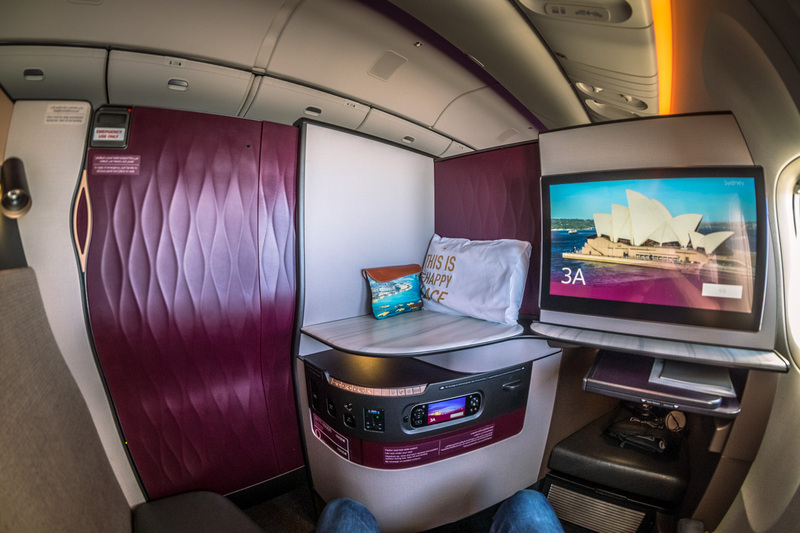 Thankfully, the gamble paid off in June when Qatar officially announced Sydney would receive Qsuites in July. I used 110,000 Asia Miles, per person, for the one-way Sydney (SYD) to Geneva (GVA) flights. American Express Membership Rewards points transfer directly to Cathay Pacific (Asia Miles). I accrued my Amex points by using my Platinum Card® from American Express which is a card loaded with travel benefits and perks. Hot Tip: Want to try Qsuites for yourself? 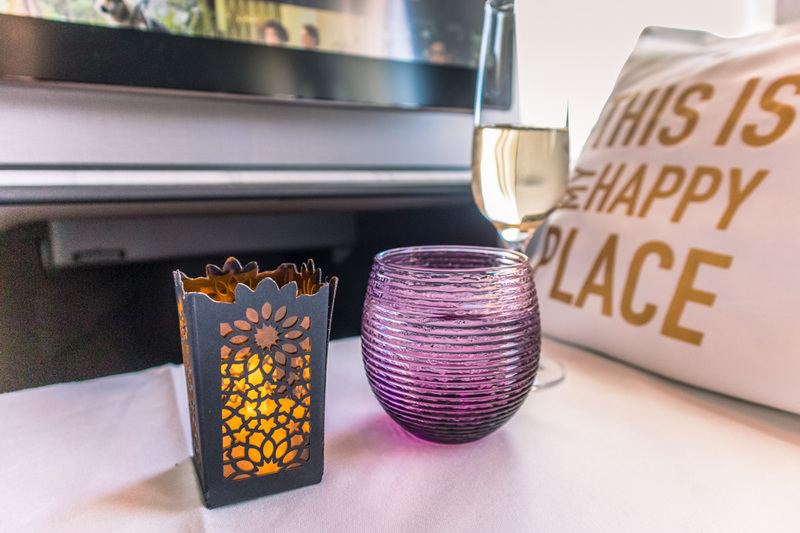 We’ve written an extensive guide on the best ways to book Qsuites using points. 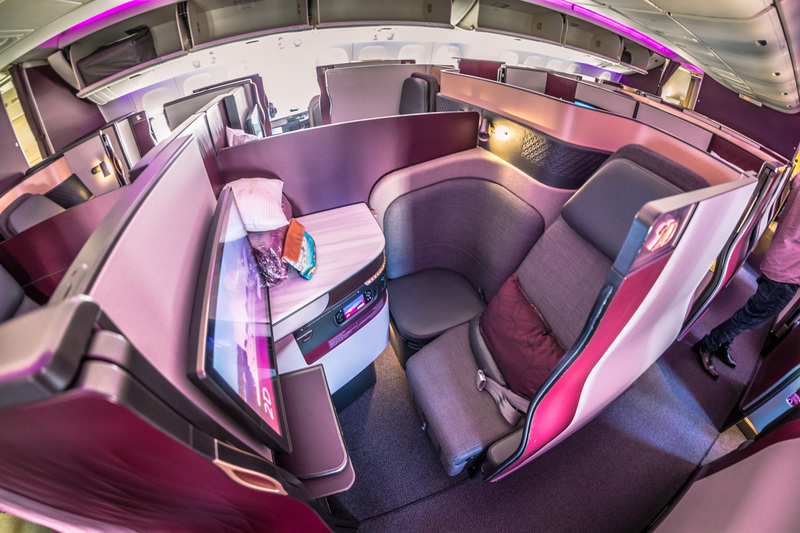 Since Qatar Airways award seats in and out of Sydney are rare, I set up automatic Oneworld searches on Award Nexus to find seats. After scheduling the searches to commence at the unlocking of the schedule, it took 3 months for 2 seats to unlock. However, even though the seats were unlocked, I had no choice of days — it was January 25 or nothing. 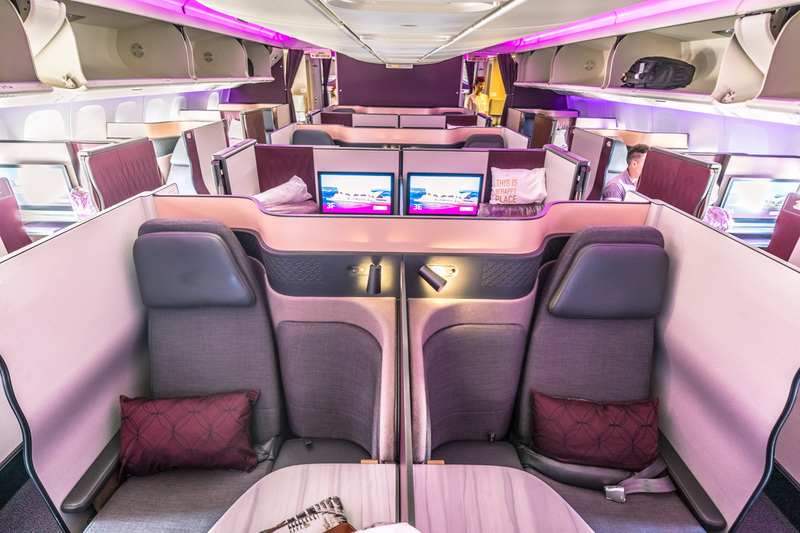 Even in February of 2019, when I look through the entire booking schedule till February 2020, I can only find two seats on the last two days of February on either the A380 or new A350-1000 (which replaces the 777 on the Sydney route on October 28, 2019). 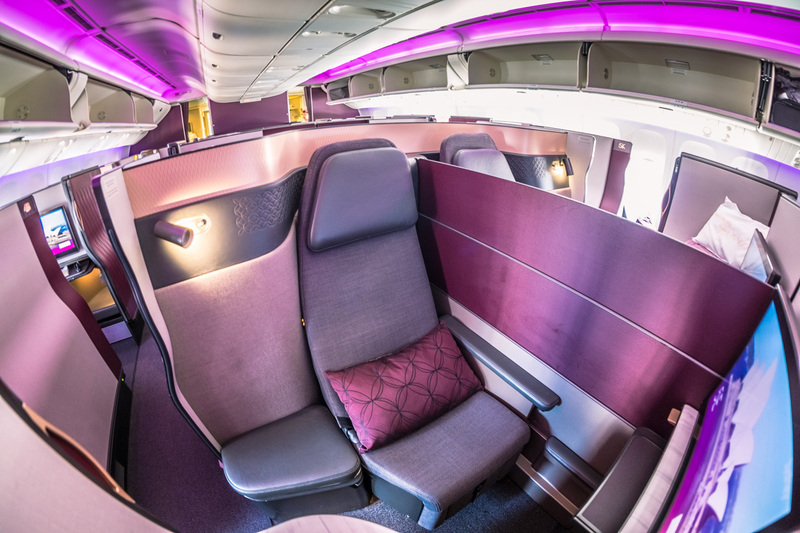 Qatar Airways staff directs Qatar Business Class passengers to the Qantas Business Class Lounge (Airside, Level 3). 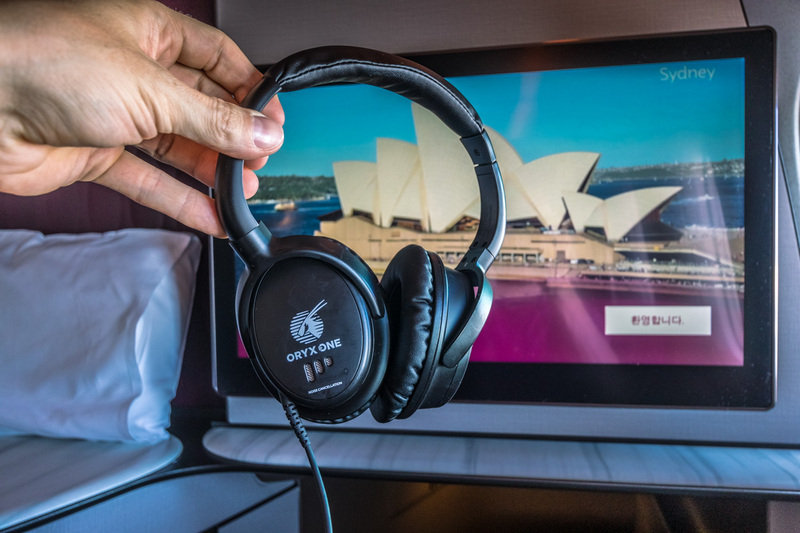 The Sydney airport was a nightmare on the Friday afternoon of our departure and it took us considerable time to get through security which eroded precious lounge time. The Qantas lounge was bursting at the seams and is long overdue for a refresh; thankfully, a lounge is scheduled to be refurbished by the end of 2019. After a quick drink and a bite to eat in the Qantas Lounge, I decided to see if the American Express Lounge was any better and might allow me to capture a photo of our inbound aircraft arriving from Canberra. The American Express Lounge, due to its west-facing position, was a furnace and full as well. I snagged the last available seat, thankfully by the window, to see the A7-BEN arrive. After 5 minutes by the window, I was sufficiently roasted and left the lounge. We eventually decided it was more pleasant waiting at the gate then staying at either lounge. 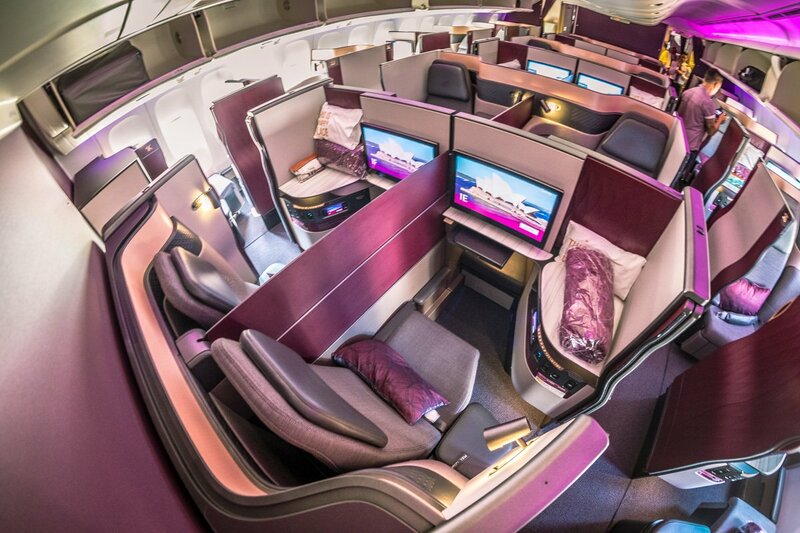 Qatar Airways currently has 48 Boeing 777-300ER in its fleet. 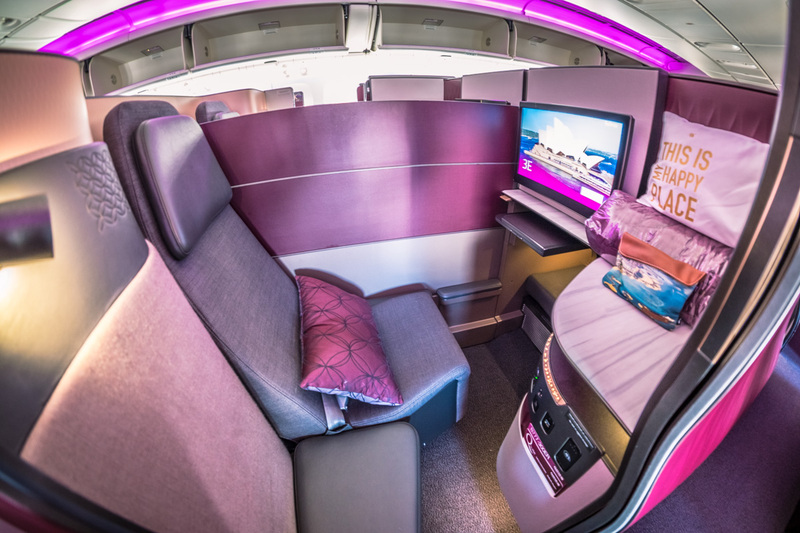 The new/refit aircraft feature 48 Qatar Business Class seats which are dubbed “Qsuites” in a 1-2-1 layout split across two cabins, as well as 312 seats in Economy in a 3-4-3 configuration. My aircraft, A7-BEN, was delivered factory-fresh with the new Qsuites in December 2017. Stepping onto the aircraft, we were greeted with the illuminated Qatar branding building our anticipation. 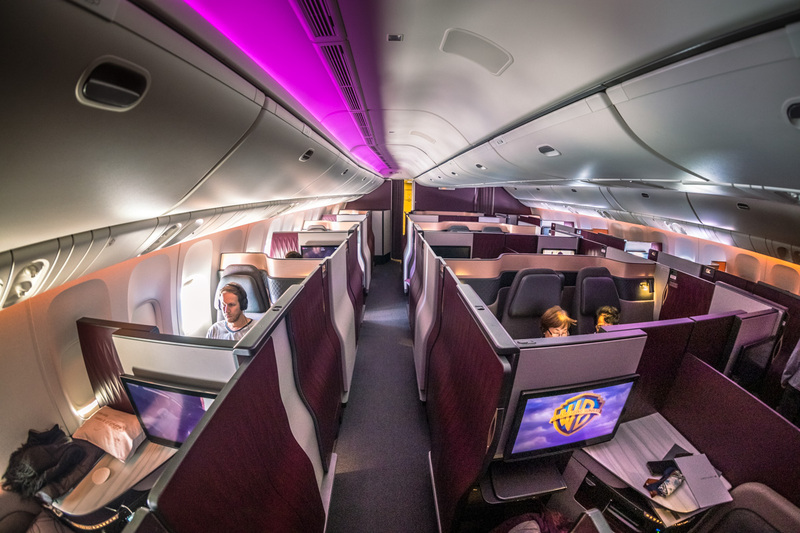 Turning right, the overhead lighting flooded the cabin with purple/pink mood lighting and it looked spectacular. 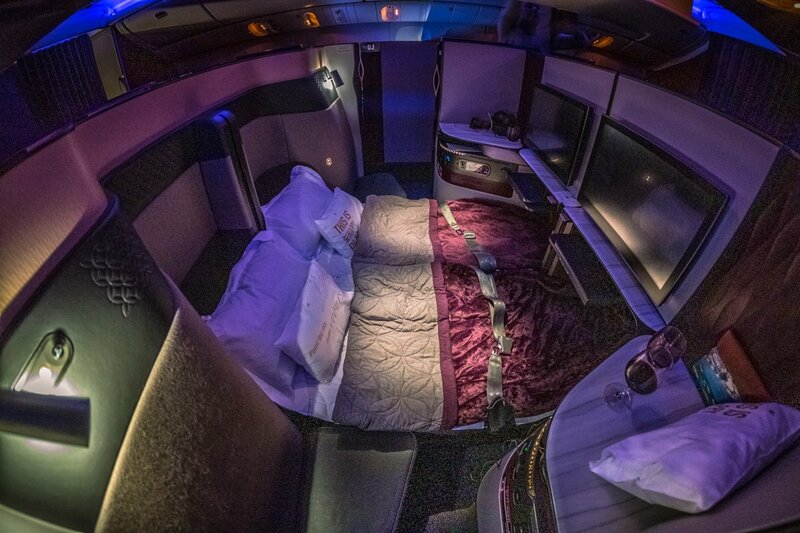 The cabin is arranged with four seat options; in the middle of the cabin there is either the double suite or aisle-side seats. Or a window seat located closer to the aisle or one directly alongside the windows. 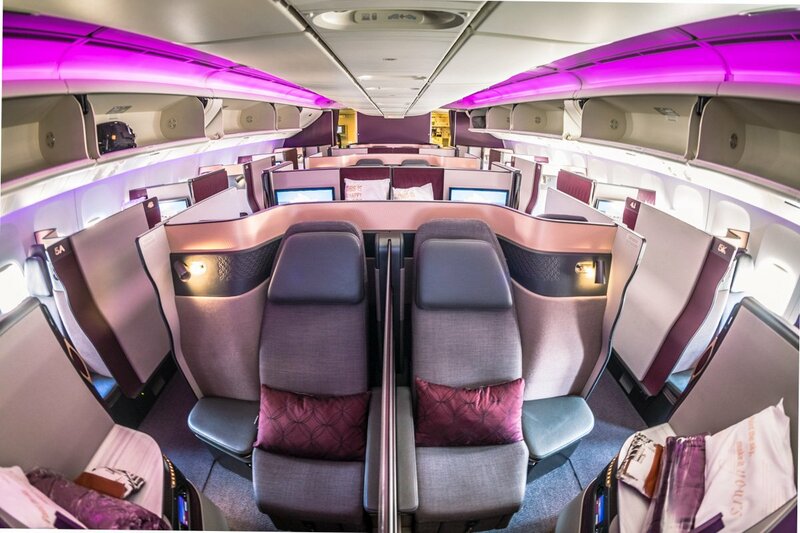 The double suite, seats E & F, face the rear of the cabin, whereas seats D & G face the front. The E & F seats have the privacy dividers up when boarding. Rear-facing seats E & F can be combined with the forward-facing D & G pair to create a quad setup. These D & G seats sit alongside the aisle and, although they are further apart from each other, there is still a privacy panel between them that can be lowered if you’re traveling together. The forward-facing B seats have windows but the seats sit alongside the aisle. 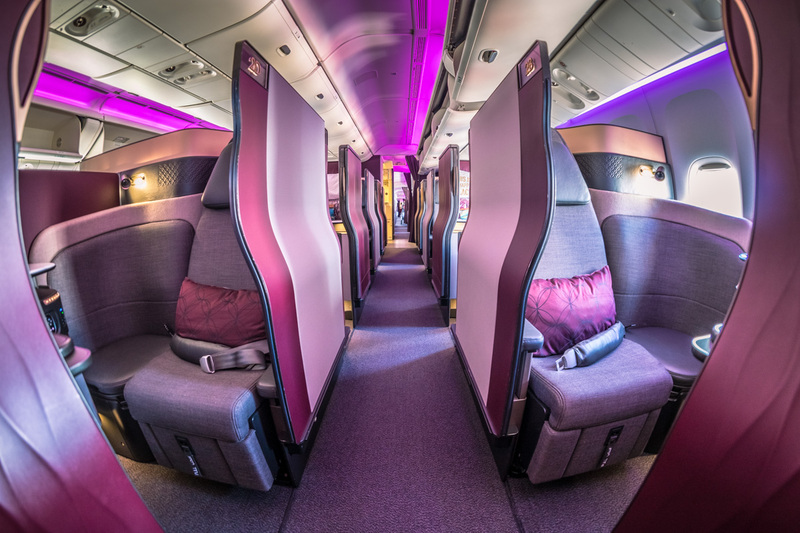 The A seats will be an Aviation Geek’s (AvGeek) favorite as those seats have 3 windows, something usually only found in first class suites, face rearwards towards the wing and engines, and positioned away from the aisle. As my partner and I both love a window seat, we decided against picking a middle pair of seats and instead, I selected 3A with my partner in 4B. I had been monitoring the seat map all the way up to departure and was expecting the cabin to be half-empty given only 2 of the 6 middle seats were taken. I thought it may have been possible to try both window and middle seats. As check-in opened, the cabin filled up except for one empty seat! 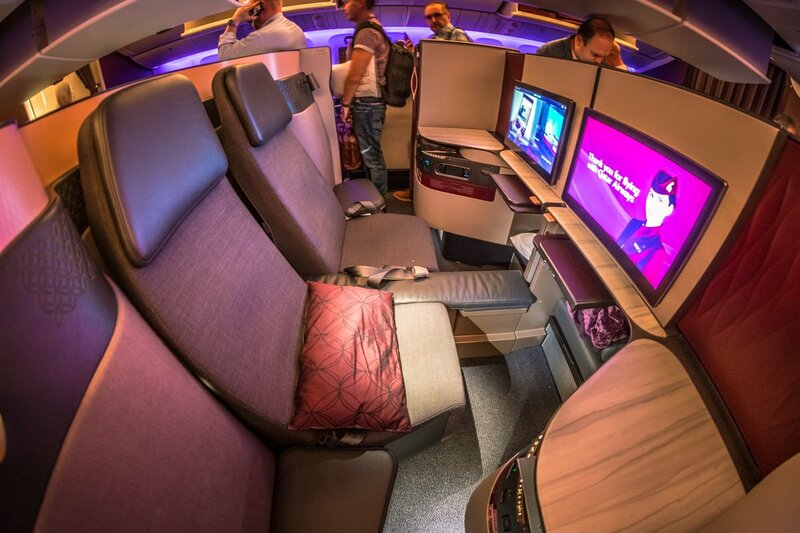 Qatar Airways blocks all the middle seats unless you have a booking of four people to occupy a quad as first priority. It’s only when the middle seats remain empty that they unlock them to couples, then unlock all seats when check-in opens. All suites have direct aisle access. 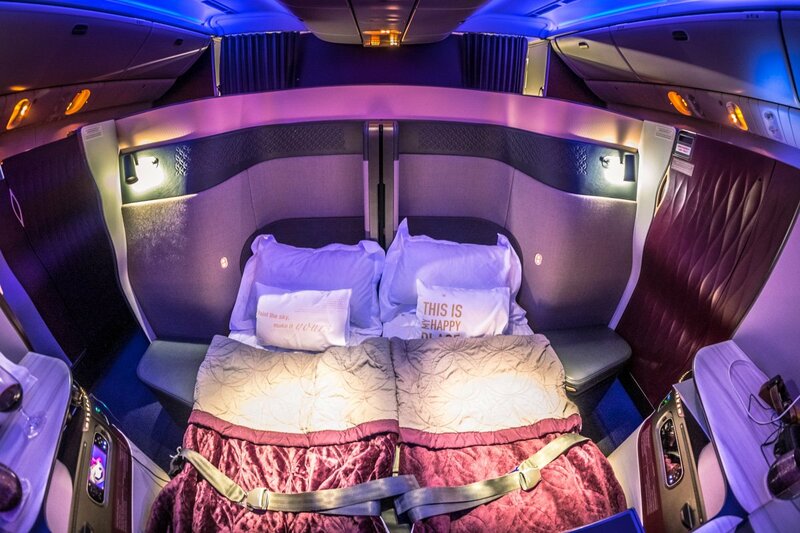 Qatar’s signature burgundy is used throughout the cabin including the suite doors, middle privacy dividers, pillows, and bulkhead. This color contrasts against the cream/light-pink suite panels. 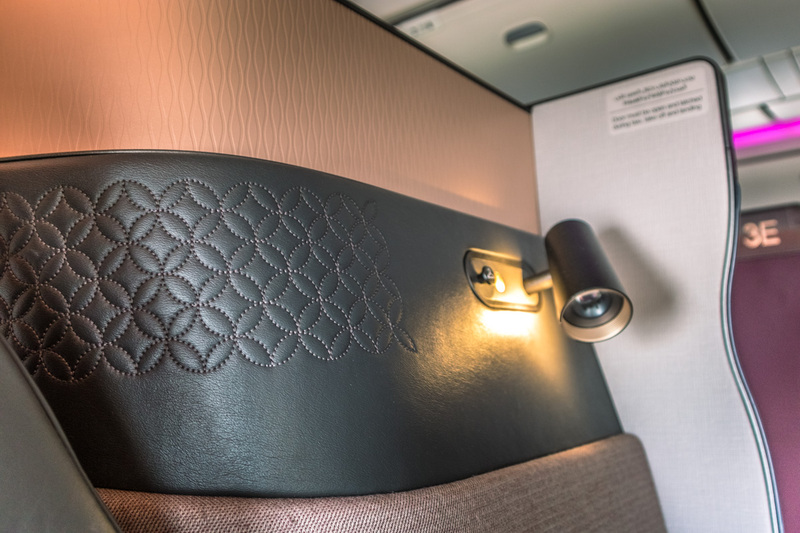 Everywhere you look, the surfaces have exquisite detailing, and you just want to run your hands over them (after you’ve wiped them with the pre-flight hot towel of course). To the waffle pattern on the suite’s doors and the marble-like effect on the countertops. This cabin is absolutely spectacular! 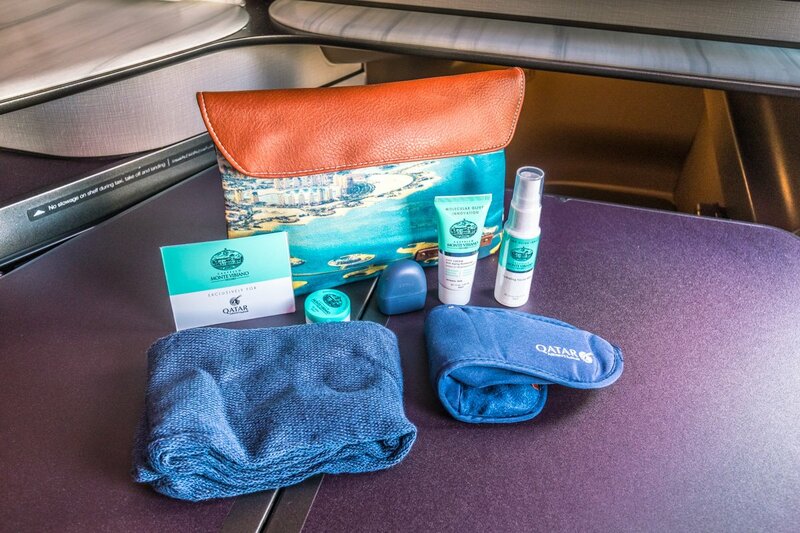 Upon taking my seat, I was welcomed with a duvet, amenity kit, and a souvenir printed pillow (yes, you can take the pillow home). The pillow makes a great prop for an Instagram photo. Under the console was an open storage bench with seat controls in easy reach. Below the storage console, I found a NFC reader, HDMI, USB, headphone input, power sockets, and the retractable inflight-entertainment remote. To further my comfort, I found a foot cubby that felt wider than a reverse herringbone seat. 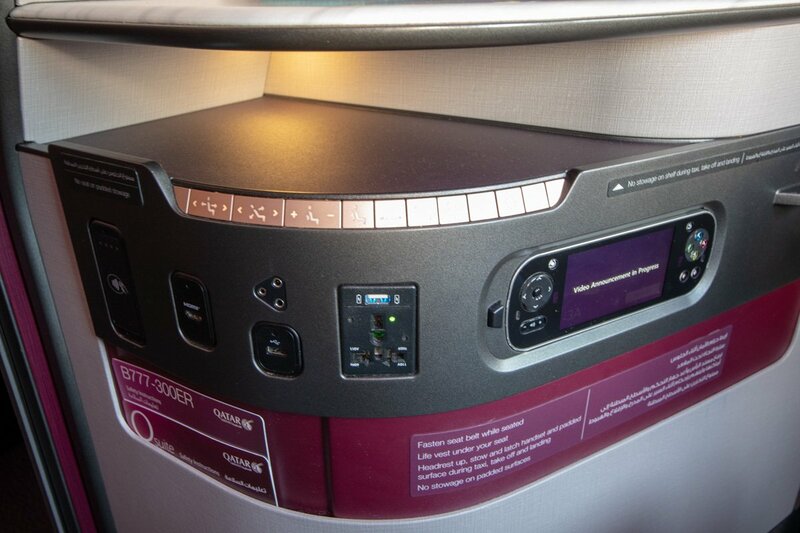 The tray table pulls out from under the inflight entertainment screen and flips over to expand. The seat had a meal service mode that tilts the seat more upright and makes it more suitable for eating. This compensates for the tray table which doesn’t extend further out. 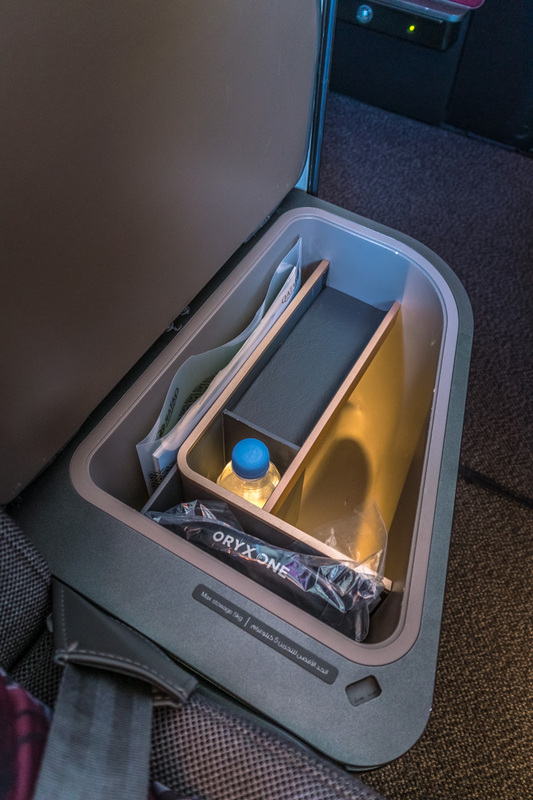 A storage compartment with lid sat alongside the seat that includes the headphones and a complimentary water bottle. After take-off, the crew went around the cabin to unlock the suite doors and demonstrate to the passengers how to open them. I believe the height of the suite doors are perfect given whenever I walked down the aisle, I didn’t lock eyes with any seated passengers. Note: image below was taken with the camera higher than eye-level. However, I did get a fright when I was lying in the bed watching a movie and the head of a crew member would just appear over the top of the door! 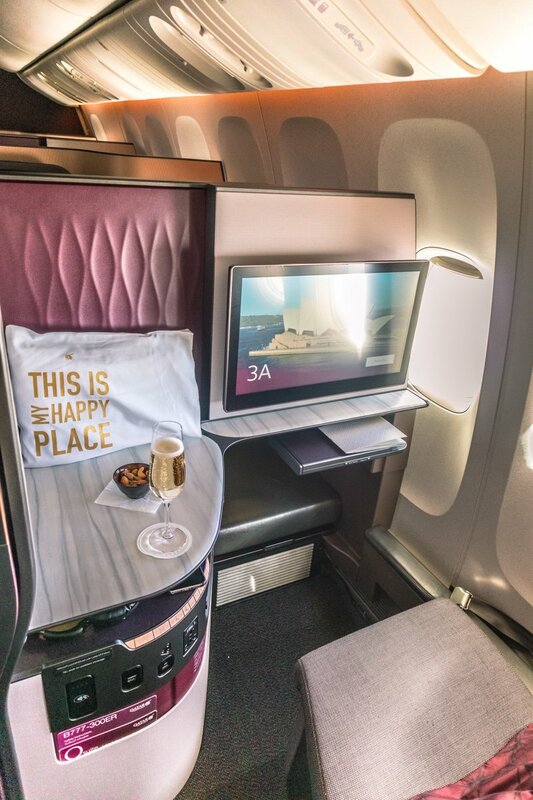 Unlike my last Singapore Airlines First Class Suites flight, the Qatar Airways crew were diligent in keeping the suite doors closed at all times for those passengers who wanted privacy. 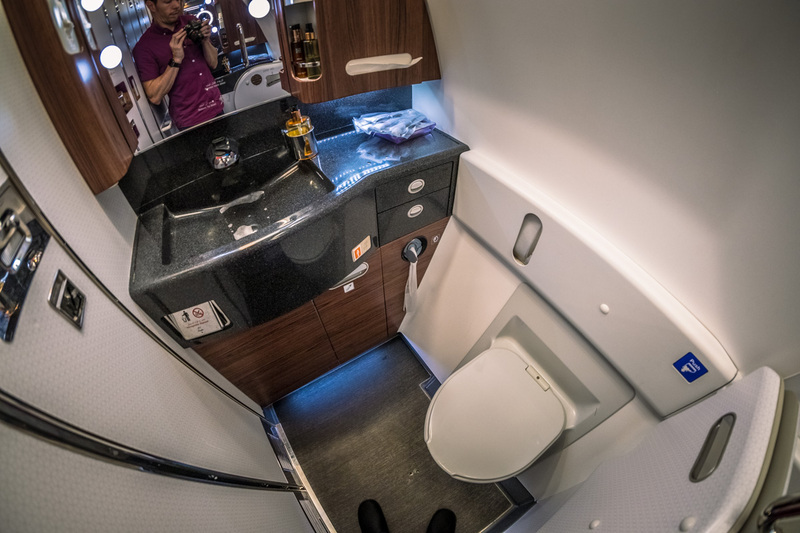 Two lavatories were located at the front of the aircraft and another 2 lavatories between the 2 business class cabins. Zico, the cabin manager, spotted my partner and I having a chat over the top of the suite wall after take-off and said that if there had been another empty seat, he would have arranged to move us to a middle pair. I thanked him and shared that we had originally selected the window seats given that we prefer window seats. He then asked if we would want to try the middle seats, assuming he could find someone to swap for a window seat. I said I didn’t mind, but only if the other passenger wanted a window seat. Before the meal service, Zico indicated that he had found a passenger who wanted a window seat and would happily swap his middle E & F seats. Given we didn’t want to disrupt meal service, we arranged to swap seats after meal service was over. The double suite was noticeably more spacious. 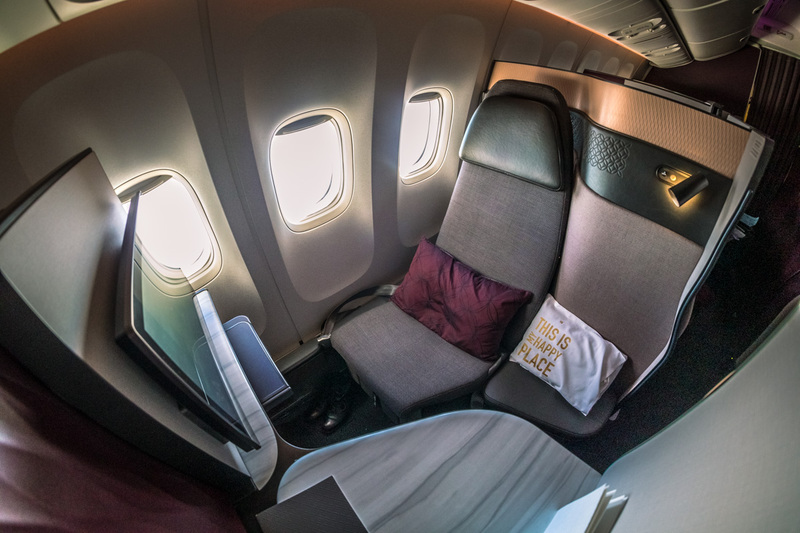 With the privacy divider completely down, the crew also install a padded cover over the divider to create a flush surface with both seats (something Singapore Airlines doesn’t do with their new Business Class double beds). 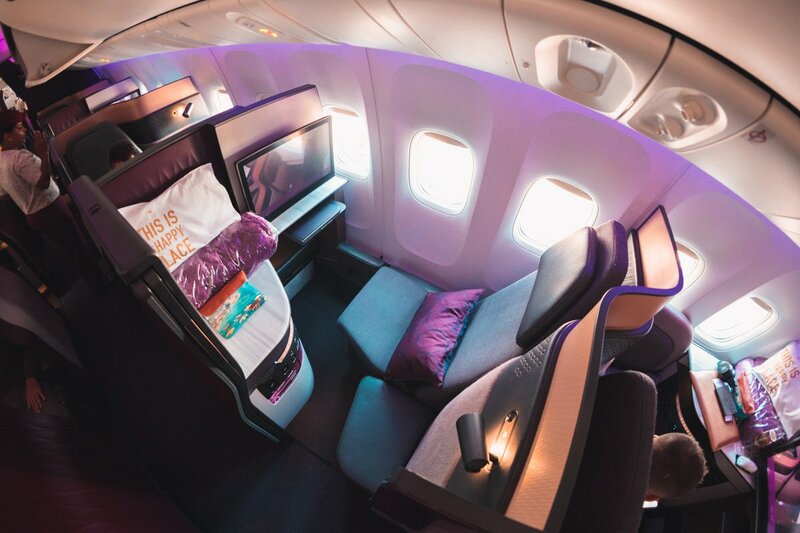 When it was time to get some sleep, I paged a crew member and whilst they converted the seats to beds, we slipped into our pajamas. 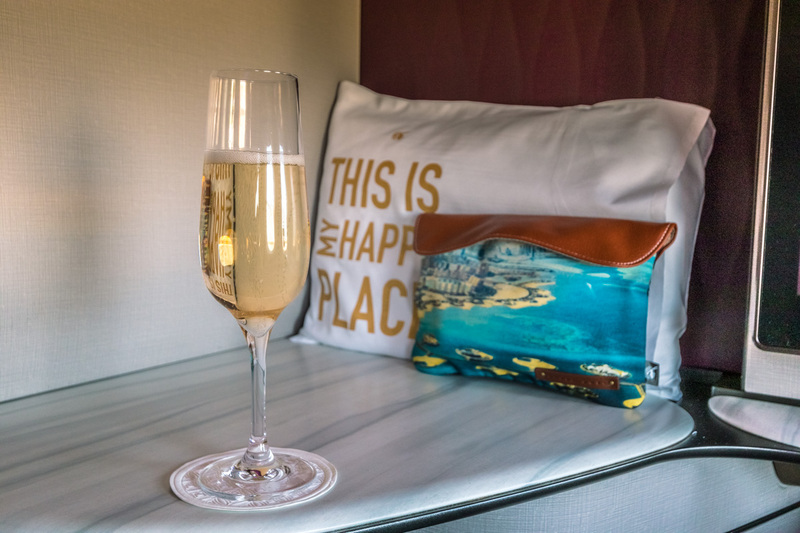 As I returned to my suite, I found my seat converted into a bed with a mattress pad, soft duvet, a new white pillowcase placed over the burgundy pillow, and the souvenir printed pillow placed in front for a great display. 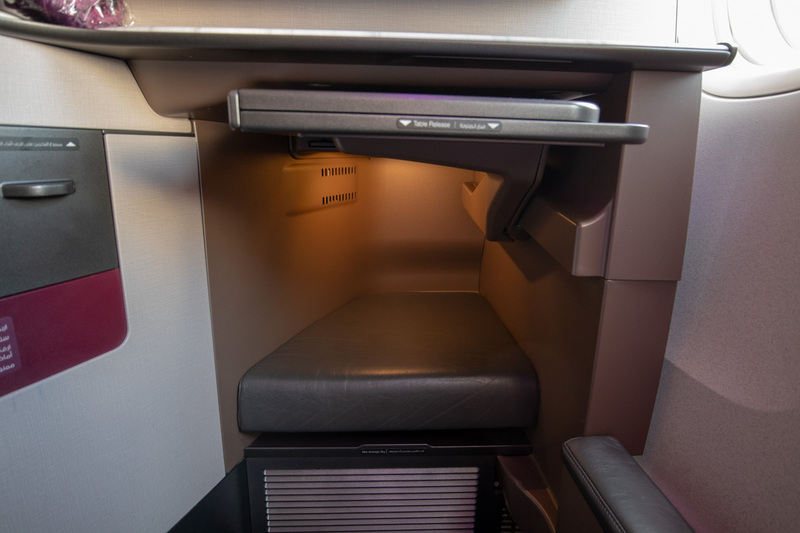 With the wide foot cubby, comfortable and cool pajamas, fully-flat bed, cool airflow courtesy of the adjustable air nozzles overhead, it was the best sleep I’ve ever had in a business class cabin. 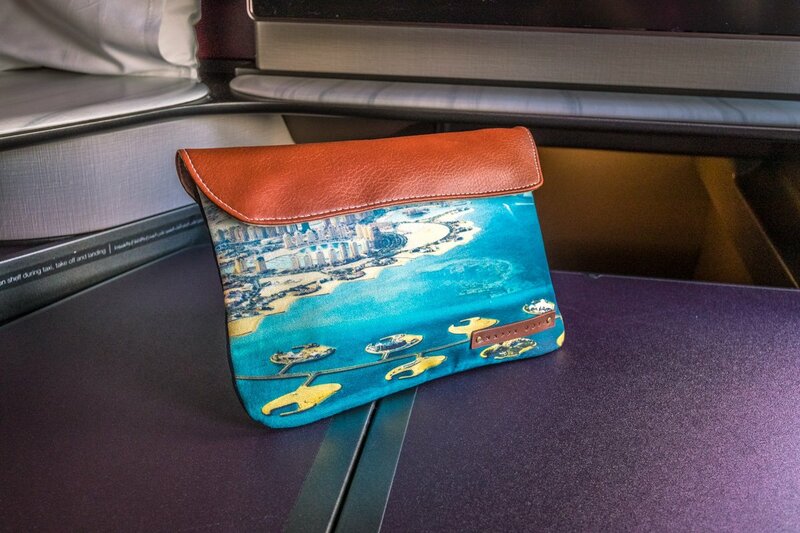 Qatar Airways recently launched new printed Nappa Dori amenity kits to celebrate Qatar National Day. The contents remain the same as the previous BRIC’s kits and featured earplugs, socks, an eye mask, Monte Vibiano lip balm, moisturizer, and facial mist. 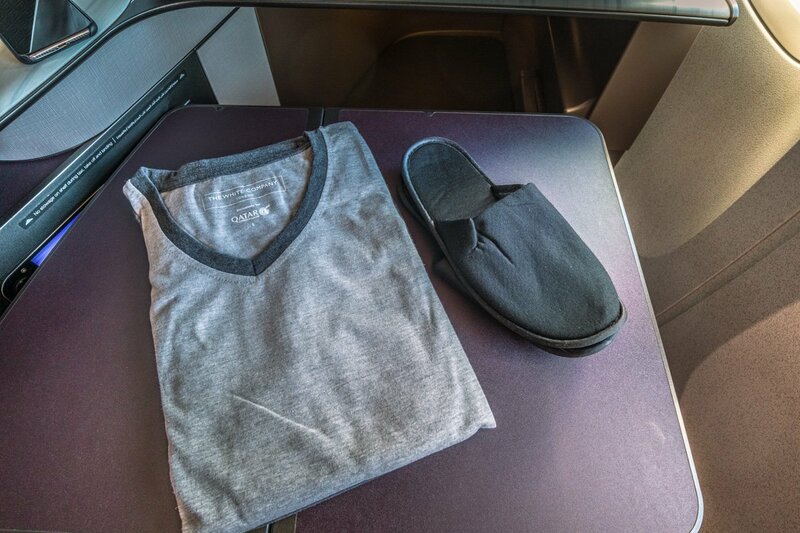 Grey v-neck pajamas from the White Company were also provided. These pajamas were a perfect fit for me, which was a refreshing surprise given airline pajamas always seem to be a few sizes too large for me. Slippers were also provided for those trips to the bathroom. 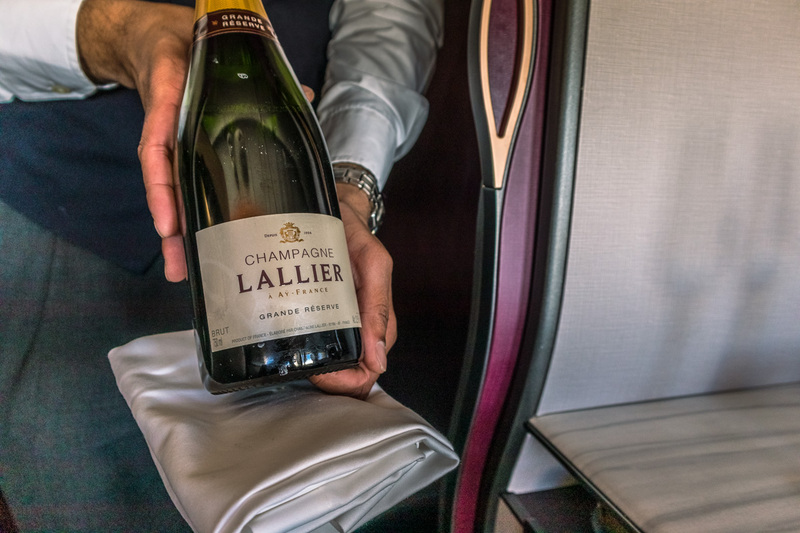 Before takeoff, I was offered a choice of Lallier Grande Reserve classic Champagne or Atair rosé Champagne. These Champagnes retail for $40 and $25 a bottle respectively. I opted for the Lallier, and the crew was very proactive with refills and even topped up my glass as we were pushing back from the gate in Sydney. After takeoff, I asked to try the Atair rosé. 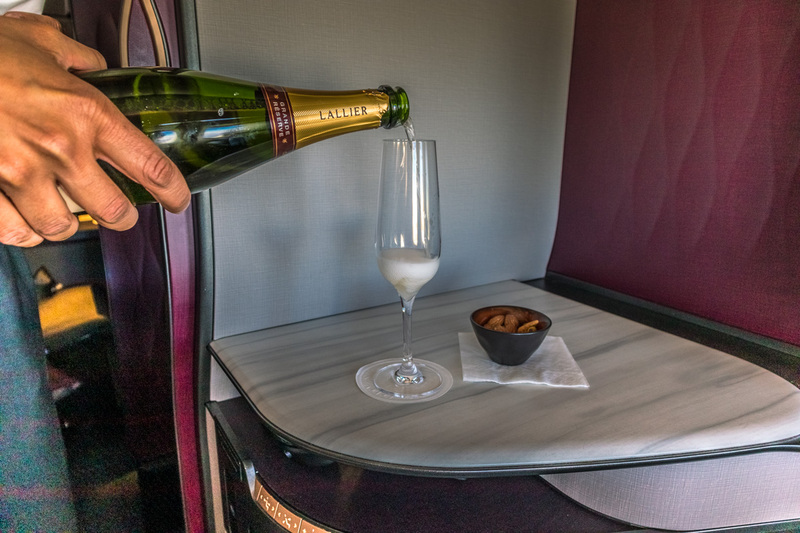 Unfortunately, the crew said they had already run out so I kept with the Lallier Grand Reserve as I sipped my complimentary Champagne accompanied by warm nuts. The crew asked us when we wanted to dine and I was happy to eat straight away, but my partner asked for an hour break until the meal. 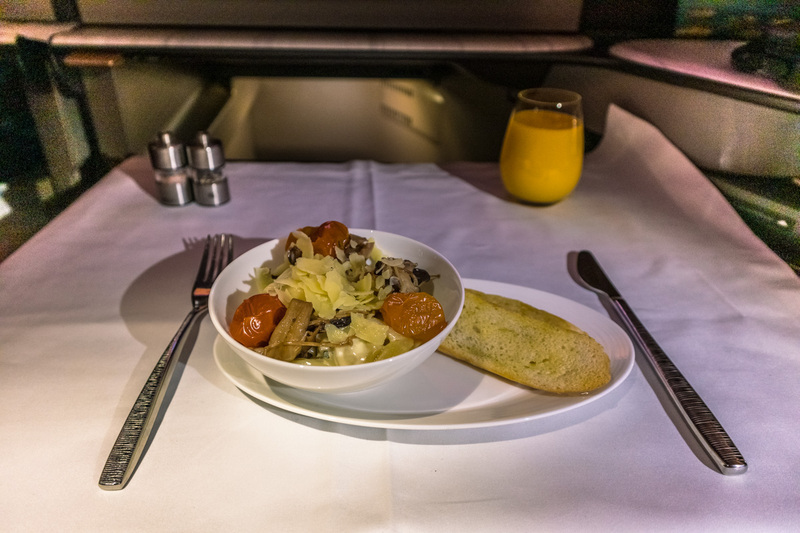 However, despite the request to delay service, both of our meals were served soon after takeoff. Qatar Airways crew members don’t run trolleys through the cabin or use meal trays for any meal service. 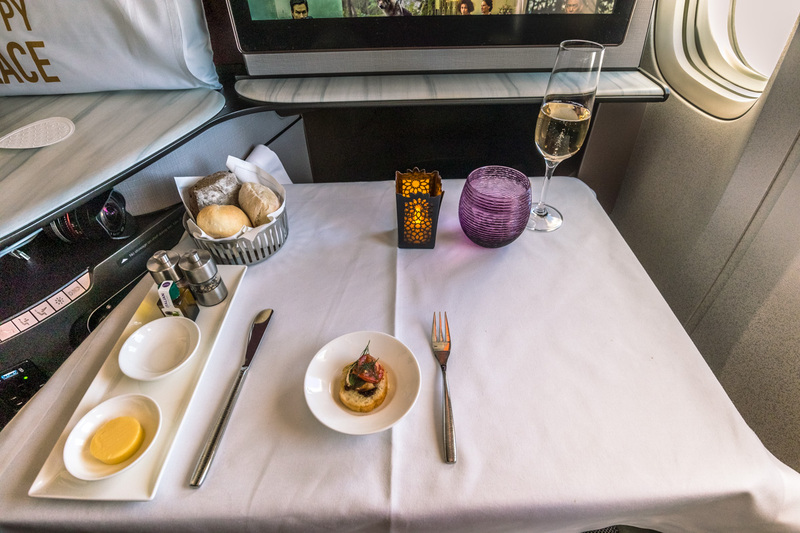 Instead, the crew provides a restaurant-style dining experience where everything is placed on your tray table individually. 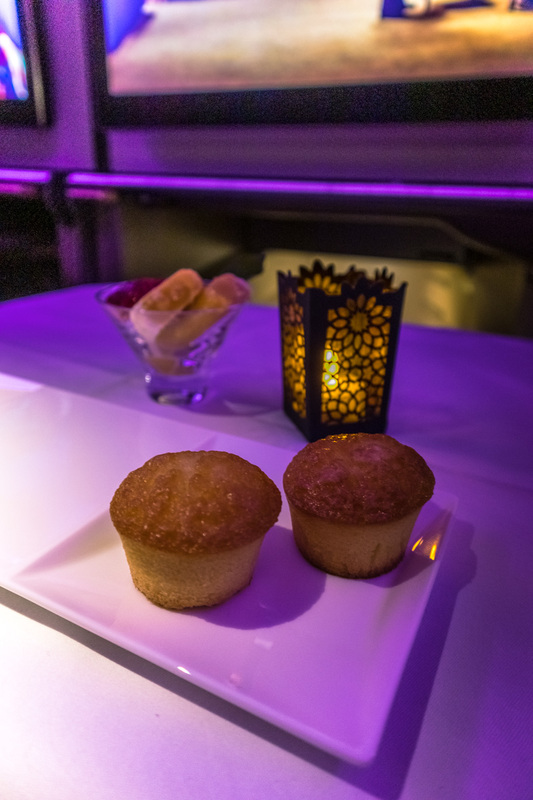 The crew sat the table with a cute LED tea light, purple water glass, and a bowl of assorted bread rolls. 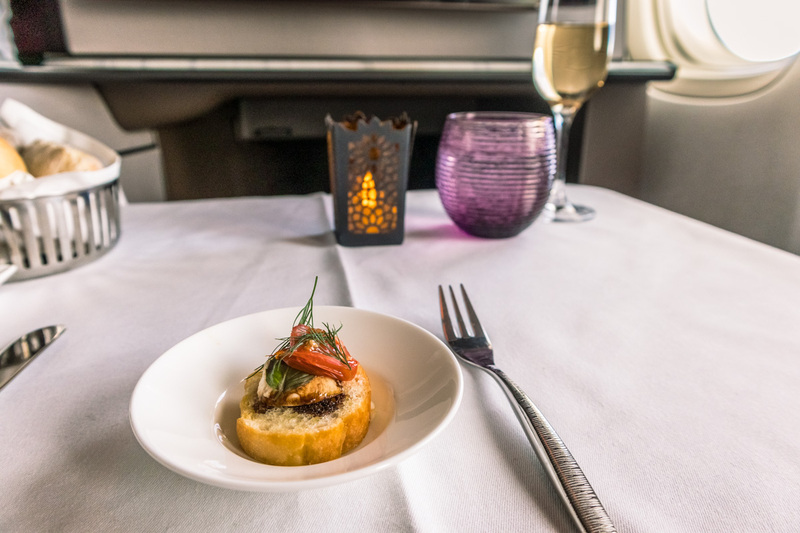 The meal service started with an amuse-bouche — something I’ve never experienced in a business class cabin, and only usually in first class. 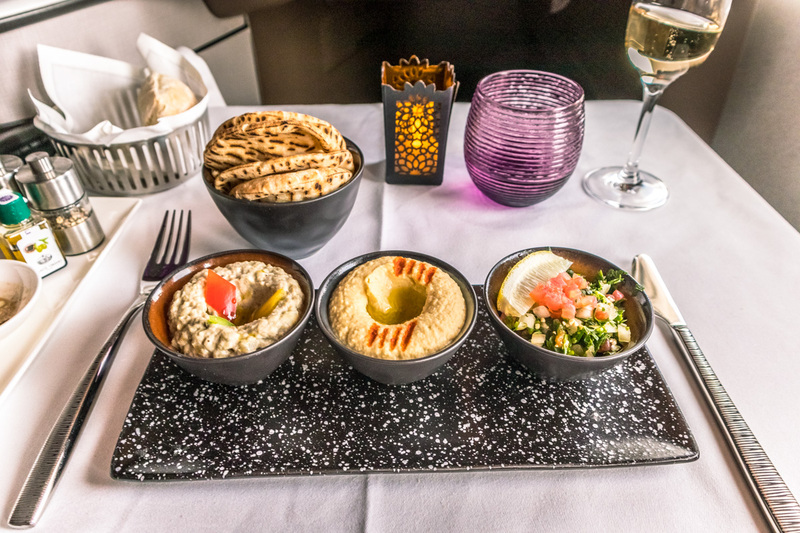 For the entrée, I couldn’t pass up the Signature Arabic Meze with hummus, tabbouleh, and moutabel with Arabic bread. It was an excellent choice. Fraser Island crab by George Calombaris with tabbouleh, tomato, smoked paprika cracker. For the main course, I chose the George Calombaris braised beef short rib with potatoes a la Grecque, caramelized and pickled onions that was incredibly tender and had a surprisingly spicy kick. I paired it with the 2013 Chateau Vieux Maillet ($40 a bottle). We chose not to have dessert until we moved seats. I opted for the white chocolate brownie from the Snack Platters menu, which came out as two muffins to my surprise. The crew also brought two blocks of sorbet to accompany the muffins as they ran out of ice cream. Gourmet ice cream selection (if it hadn’t run out). Breakfast was strangely offered before the midnight arrival into Doha. I thought eating breakfast before midnight might mess with my body clock, so instead, I selected the mushroom tortellini with sage velouté and fricassee of wild mushrooms from the Light Options menu. Fruit French toast with mixed berry compote. If all of this food wasn’t enough, there is also a selection of lighter options and snack platters. Baked mushroom with goat cheese. Overall, the meal service was excellent. The only problem was, with the extensive menu options, it can be hard to make a decision! The beef main, while delicious, only came with a small portion of beef. Plus the brownie wasn’t as described, and it was disappointing they ran out of ice cream. 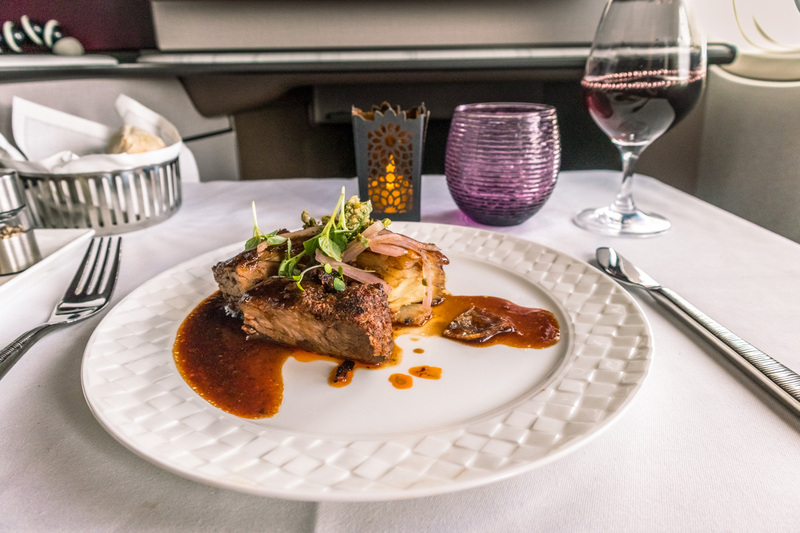 I guess that is the downside of such an extensive menu, and I can imagine that it is challenging to get the catering levels right for each flight. Overall, the service could not be faulted. All the crew members were friendly, professional, and very proactive, even with a full cabin. I never had to use the call bell, and even with a closed suite door, the crew continued to check for drink refills and if we wanted anything from the menu. Zico, the cabin service manager, was the highlight of this flight. He arranged the seat swap to the double suite and continued to check in on us throughout the flight as well. 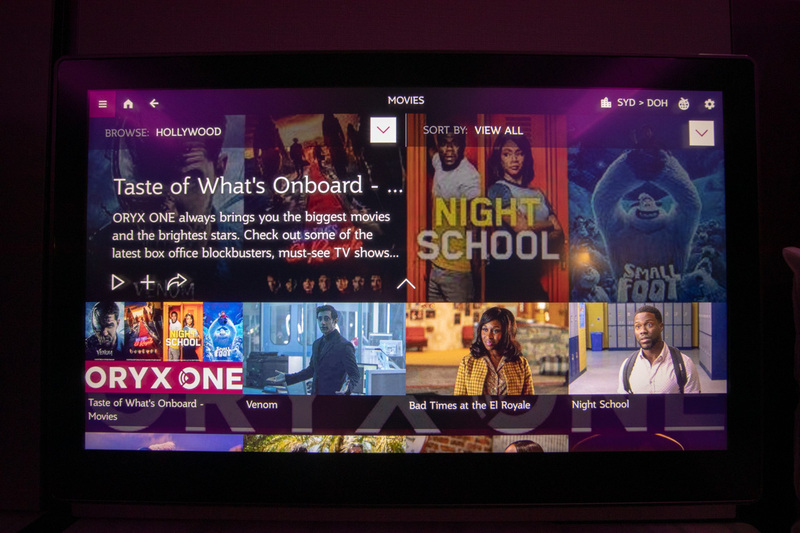 A huge, fixed 21.5-inch touchscreen display sat directly ahead of us and could be used gate-to-gate. 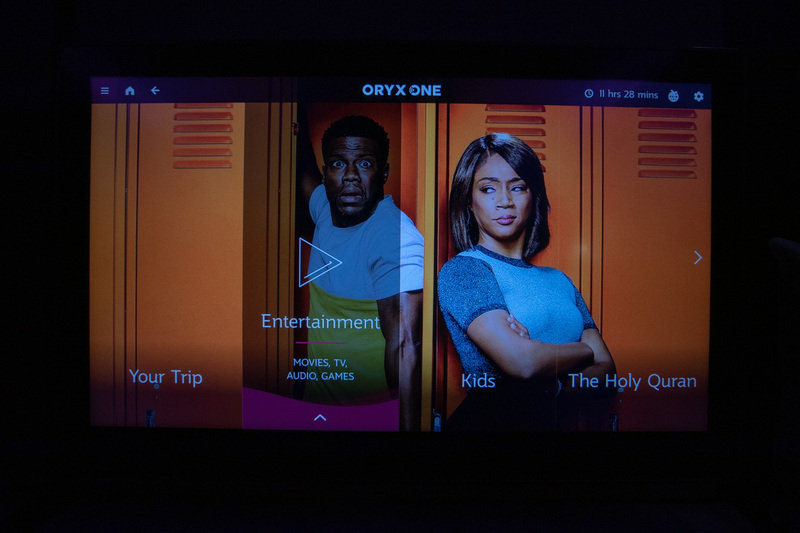 Branded Oryx One, the system has a fair selection of content from the latest release movies, TV shows, audio, and games. You can control the system using either the touchscreen or the in-storage retractable remote that also has a touchscreen. Noise-cancelling headphones were thankfully provided as I had lost my Bose QC35 adapter before this flight. Unfortunately, the provided Qatar headphones became quite uncomfortable to wear after an hour. My partner watched a movie he’d seen a number of times before — ‘Spy’ with Melissa McCarthy. He mentioned that the level of censorship considerably altered the movie and storyline. Every profanity was dubbed over with G-rated alternatives, some scenes were completely removed, and what was supposed to be a ‘comedy’ was significantly less funny with the modifications. Although we know that censorship is common practice on airlines, it made him wonder why the movie was included onboard in the first place if it required such extensive censorship. Qatar Airways Super Wi-Fi was available on this Boeing 777, and as the name suggests, was super fast for aircraft standards. Qatar provide one-hour complimentary access with no data cap. I clocked 8.48 Mbps download and 5.97 Mbps upload. After the first hour expired, it only cost $10 for a full-flight pass, which is an absolutely incredible value for unlimited data at decent speeds for 14 more hours of flying! 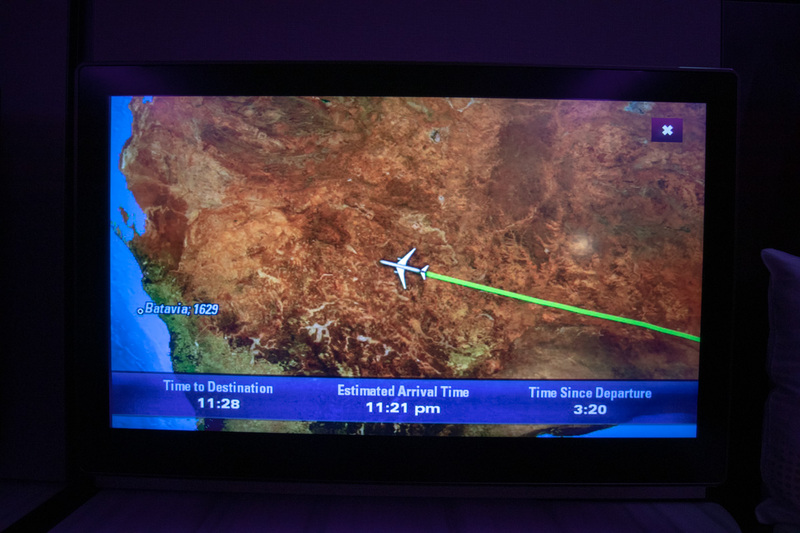 Oddly enough for such a new aircraft, the inflight entertainment lacked a 3D moving map to track your flight. 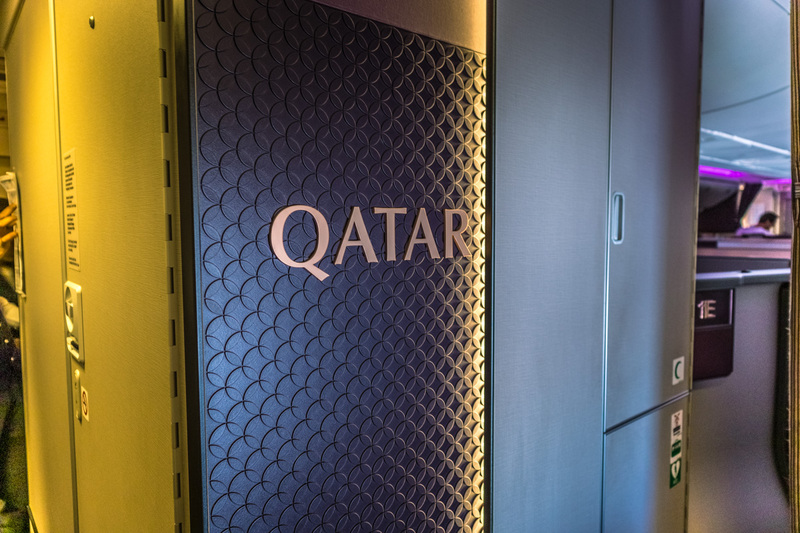 I had been waiting since the official announcement in March 2017 to experience Qatar’s Qsuites, and based on everything I had read, I had very high expectations. Did my experience live up to those lofty expectations? Absolutely! 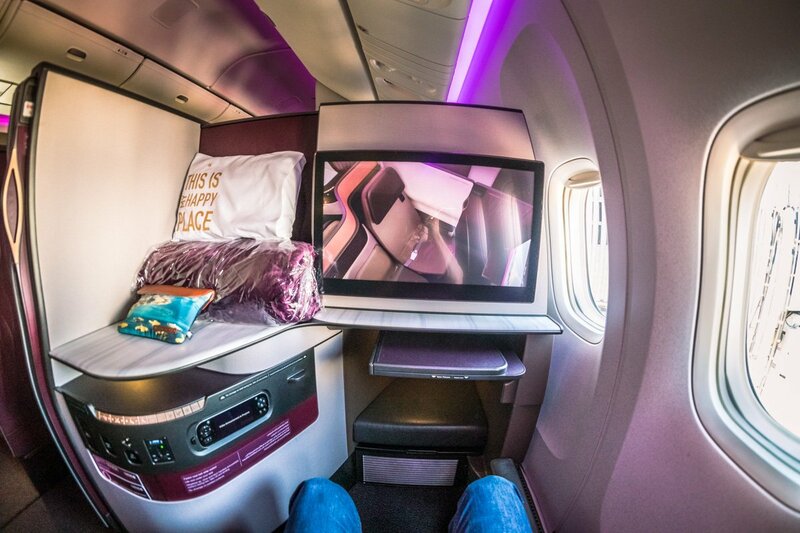 Is it the best business class product flying right now? In my opinion, without a doubt! The hard product can’t be faulted; it’s exquisitely detailed and looks spectacular. Functionally, everything has been thoughtfully considered. 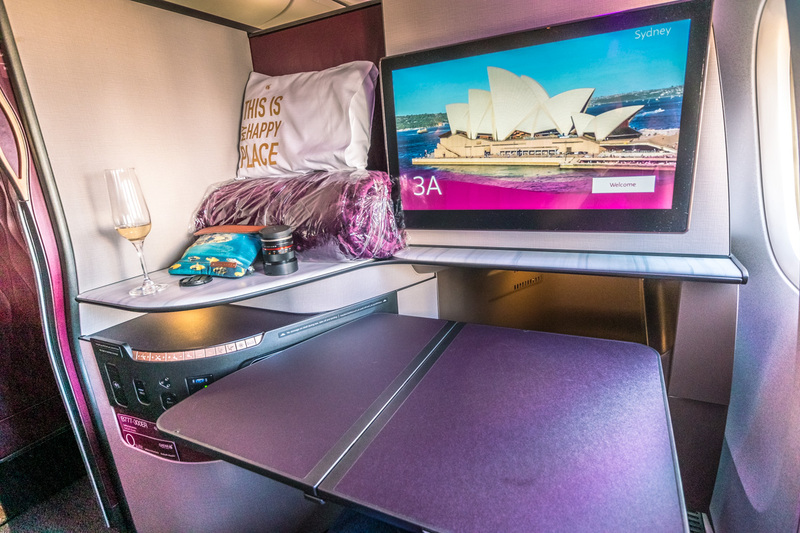 The soft product also excels; we were so fortunate to be able to experience both window seats and the double bed thanks to the amazing cabin service manager, Zico. Being able to dine on-demand, eat what you want, and when you want it really helps get you into the time zone of your choosing. 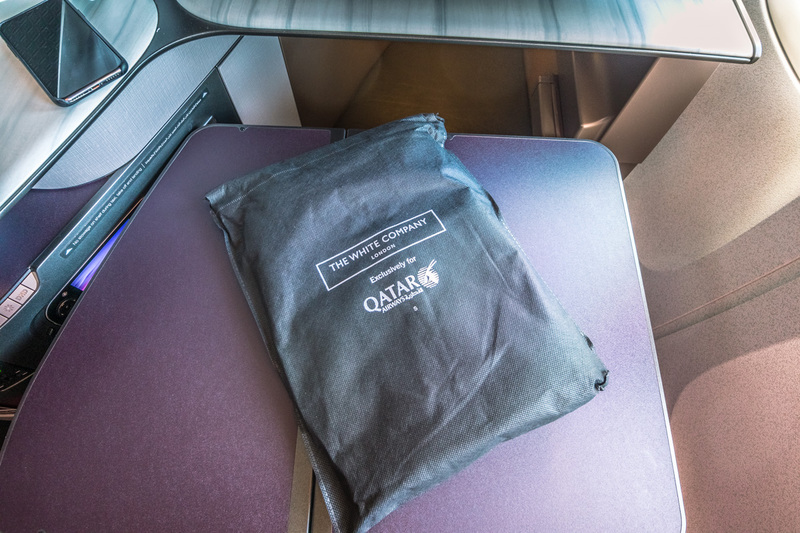 A key theme with Qatar Airways is choice; hot or cold towel on boarding? Classic or rosé Champagne? When did you want to eat? Olive oil or dressing for your salad? Which condiments for your meal? Still or sparkling water? The choices are incredible! 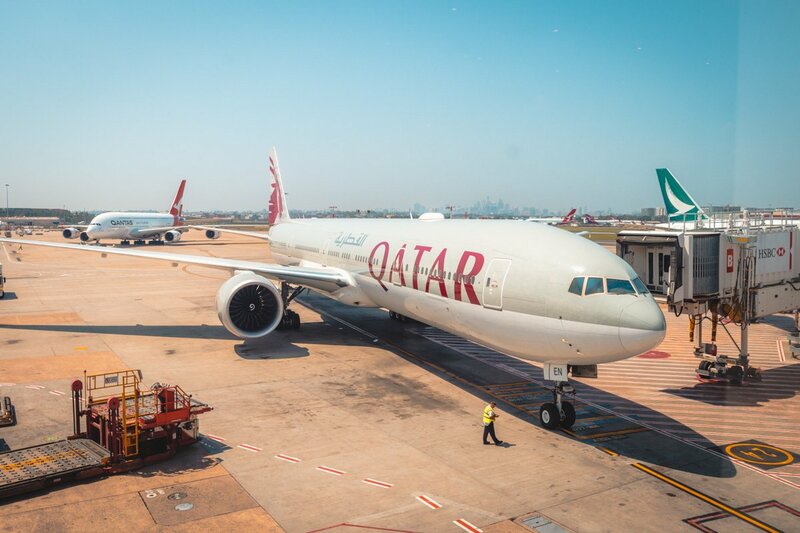 Until Australia and Qatar expand their air services agreements, Qatar Airways’ capacity between Qatar and Australia is going to remain restricted. 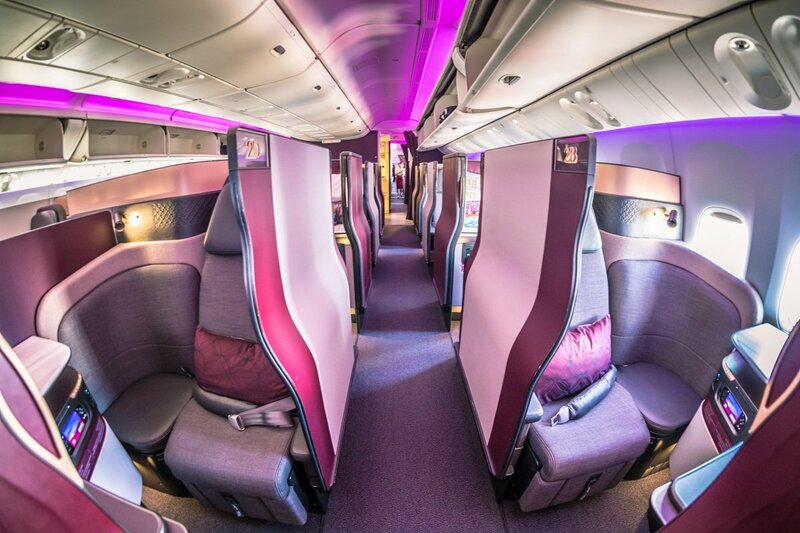 As long as Qatar has no trouble filling the aircraft with paid passengers, award seats will, unfortunately, also remain restricted. I already have more alerts set up for future award seats as I can’t wait to fly Qsuites again. Great review! I was able to select the E&F seats right after booking my ticket (as a couple). I’m Platinum with Qatar, maybe that’s why. Thanks for the feedback Michal! Sounds like your status allowed you access to seats that aren’t available to everyone else. I booked through Asia Miles and whenever I logged into the QR website to adjust seats, it wouldn’t allow me to access any of the middle seats, but as I mentioned, we were originally happy with window seats so didn’t call them.